We invite you to explore all there is to do around Downtown Milton! Historical charm, small-town character and natural beauty combine to make Downtown Milton a destination for all to enjoy. At Milton Mall, we believe that when Miltonians support local businesses, we all benefit. With over 55 stores and services, we offer a convenient shopping location for everyday essentials, without having to leave town. And, as your community mall, we’re pleased to offer a wide range of special events and play host to many community groups. Milton Mall is located at the intersection of Ontario Street and Main Street. At Springridge, we romance the seasons with merchandise to help you decorate and entertain. Springridge is also proud to support Canadian artists. Some of our local suppliers include: Chaos Tables – Morriston, Hilborn Pottery – Cambridge, First Concrete – Southampton, Lady Rosedale Tea Towels – Toronto, Madoc Rock Coasters – Madoc and Picture Depot – framed in Toronto. 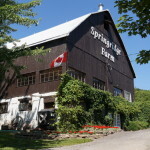 At the farm, you will find many Canadian made gourmet foods (many made at Springridge!) and we are always looking for new additions for shopping local. Every morning we bake dozens and dozens of fruit muffins using seasonal farm-fresh fruit. Farmer John and Farmer Tom come in from the fields for fresh cookies. Warm biscuits, fresh pastries and Ontario’s best Butter Tarts … all prepared daily at Springridge Farm. At Springridge Farm, we love lunch. In fact, we think lunch is the best meal of the day. An unhurried lunch made from deliciously simple ingredients is one of life’s luxuries. Springridge is the perfect destination for that kind of lunch. We are an antique stained glass store selling English windows created between 1880 – 1940. Artisans work on repairing windows on weekdays and are able to demonstrate the methods of working with antique windows. Feel free to ask them any questions you may have especially about stained glass creation and stained glass design styles. Many of our artisans are available to do commission work such as repairs or creating new windows.